The much-missed Radical Philosophy has just re-launched as an open access journal with downloadable pdfs here. The site also includes access to the journal’s wonderful archive. The criminalisation of alliances and initiatives in support of migrants’ transit should not lead us to imagine a stark opposition between ‘good humanitarians’, on the one side, and bad military actors or national authorities, on the other. On the contrary, it is important to keep in mind the many entanglements between military and humanitarian measures, as well as the role played by military actors, such as the Navy, in performing tasks like rescuing migrants at sea that could fall under the category of what Cuttitta terms ‘military-humanitarianism’. Moreover, the Code of Conduct enforced by the Italian government actually strengthens the divide between ‘good’ NGOs and ‘treacherous’ humanitarian actors. Thus, far from building a cohesive front, the obligation to sign the Code of Conduct produced a split among those NGOs involved in search and rescue operations. In the meantime, the figure of the refugee at sea has arguably faded away: sea rescue operations are in fact currently deployed with the twofold task of not letting migrants drown and of fighting smugglers, which de facto entails undermining the only effective channels of sea passage for migrants across the Mediterranean. 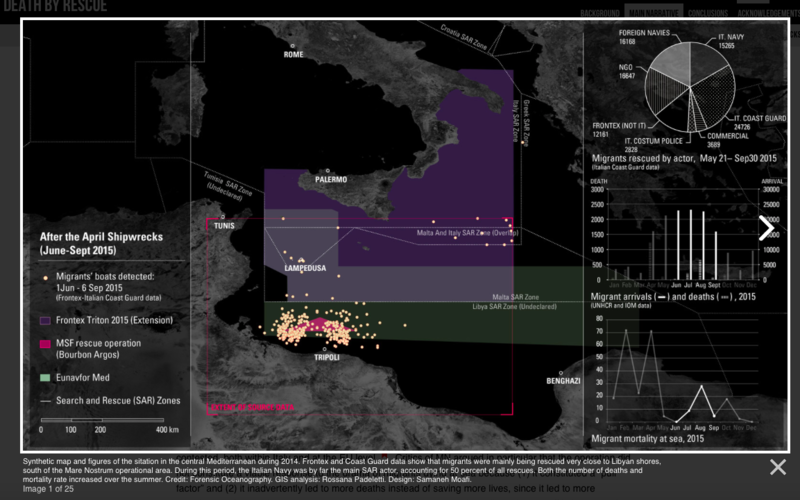 From a military-humanitarian approach that, under Mare Nostrum, considered refugees at sea as shipwrecked lives, the unconditionality of rescue is now subjected to the aim of dismantling the migrants’ logistics of crossing. At the same time, the migrant drowning at sea is ultimately not seen any longer as a refugee, i.e. as a subject of rights who is seeking protection, but as a life to be rescued in the technical sense of being fished out of the sea. In other words, the migrant at sea is the subject who eventually needs to be rescued, but not thereby placed into safety by granting them protection and refuge in Europe. What happens ‘after landing’ is something not considered within the framework of a biopolitics of rescuing and of letting drown. Indeed, the latter is not only about saving (or not saving) migrants at sea, but also, in a more proactive way, about aiming at human targets. 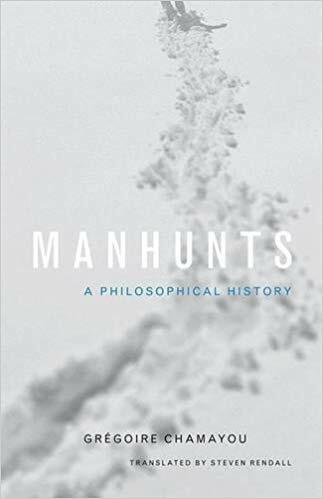 In manhunting, Gregoire Chamayou explains, ‘the combat zone tends to be reduced to the body of the enemy’. Yet who is the human target of migrant hunts in the Mediterranean? 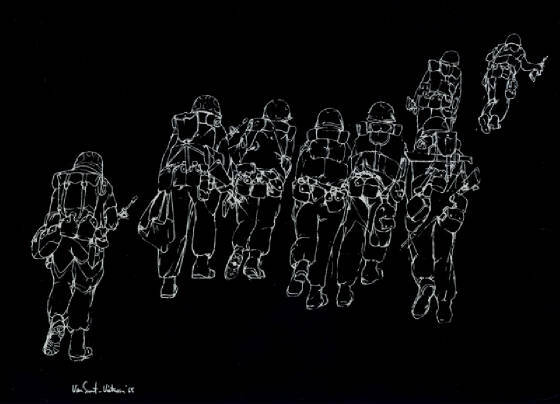 It is not only the migrant in distress at sea, who in fact is rescued and captured at the same time; rather, migrants and smugglers are both considered the ‘prey’ of contemporary military-humanitarianism. As I’ve explained in a different context, I’m no longer persuaded by Grégoire’s argument about the reduction of the conflict zone (‘battlefield’) to the body, but the reduction of the migrant to a body adds a different dimension to that discussion. Rather than vanishing from the Mediterranean scene, the politics of rescue, conceived in terms of not letting people die, has been reshaped as a technique of capture. 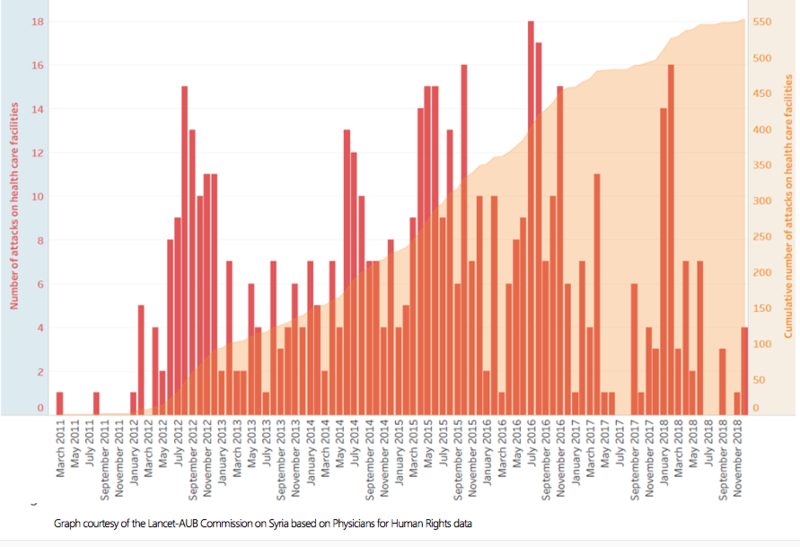 At the same time, the geographic orientation of humanitarianism has been inverted: migrants are ‘saved’ and dropped in Libya. Despite the fact that various journalistic investigations and UN reports have shown that after being intercepted, rescued and taken back to Libya, migrants are kept in detention in abysmal conditions and are blackmailed by smugglers, the public discussion remains substantially polarised around the questions of deaths at sea. Should migrants be saved unconditionally? Or, should rescue be secondary to measures against smugglers and balanced against the risk of ‘migrant invasion’? A hierarchy of the spaces of death and confinement is in part determined by the criterion of geographical proximity, which contributes to the sidelining of mechanisms of exploitation and of a politics of letting die that takes place beyond the geopolitical borders of Europe. The biopolitical hold over migrants becomes apparent at sea: practices of solidarity are transformed into a relationship between rescuers and drowned. There’s much more in this clear, compelling and incisive read. A good companion is Forensic Architecture‘s stunning analysis of ‘Death by Rescue’ in The Left-to-Die Boat here and here (from which I’ve taken the image that heads this post). News from Lucy Suchman of a special issue of Science, Technology and Human Values [42 (6) (2017)] on Tracking and targeting: sociotechnologies of (in)security, which she’s co-edited with Karolina Follis and Jutta Weber. This introduction to the special issue of the same title sets out the context for a critical examination of contemporary developments in sociotechnical systems deployed in the name of security. Our focus is on technologies of tracking, with their claims to enable the identification of those who comprise legitimate targets for the use of violent force. Taking these claims as deeply problematic, we join a growing body of scholarship on the technopolitical logics that underpin an increasingly violent landscape of institutions, infrastructures, and actions, promising protection to some but arguably contributing to our collective insecurity. We examine the asymmetric distributions of sociotechnologies of (in)security; their deadly and injurious effects; and the legal, ethical, and moral questions that haunt their operations. This essay is about the role of visual surveillance technologies in the policing of the external borders of the European Union (EU). Based on an analysis of documents published by EU institutions and independent organizations, I argue that these technological innovations fundamentally alter the nature of national borders. I discuss how new technologies of vision are deployed to transcend the physical limits of territories. In the last twenty years, EU member states and institutions have increasingly relied on various forms of remote tracking, including the use of drones for the purposes of monitoring frontier zones. 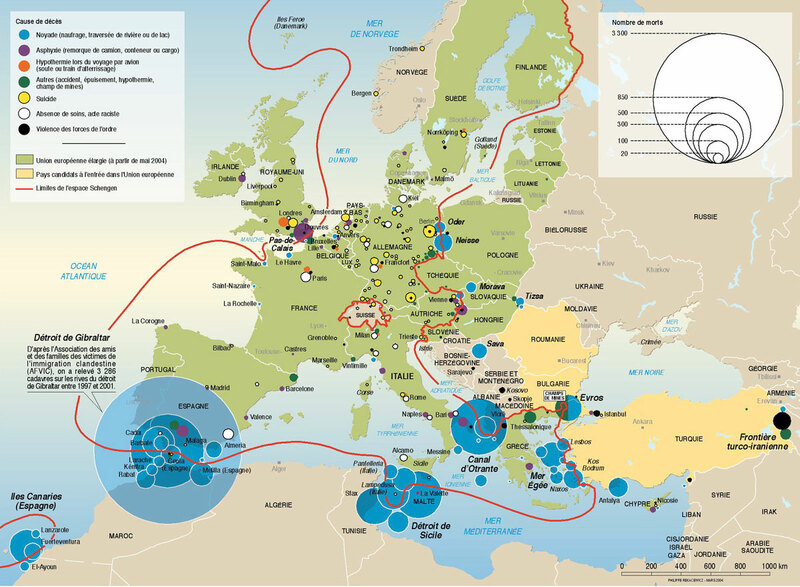 In combination with other facets of the EU border management regime (such as transnational databases and biometrics), these technologies coalesce into a system of governance that has enabled intervention into neighboring territories and territorial waters of other states to track and target migrants for interception in the “prefrontier.” For jurisdictional reasons, this practice effectively precludes the enforcement of legal human rights obligations, which European states might otherwise have with regard to these persons. This article argues that this technologically mediated expansion of vision has become a key feature of post–cold war governance of borders in Europe. The concept of transterritory is proposed to capture its effects. While the distinction between civilians and combatants is fundamental to international law, it is contested and complicated in practice. How do North Atlantic Treaty Organization (NATO) officers see civilians in Afghanistan? Focusing on 2009 air strike in Kunduz, this article argues that the professional vision of NATO officers relies not only on recent military technologies that allow for aerial surveillance, thermal imaging, and precise targeting but also on the assumptions, vocabularies, modes of attention, and hierarchies of knowledges that the officers bring to the interpretation of aerial surveillance images. Professional vision is socially situated and frequently contested with communities of practice. In the case of the Kunduz air strike, the aerial vantage point and the military visual technologies cannot fully determine what would be seen. Instead, the officers’ assumptions about Afghanistan, threats, and the gender of the civilian inform the vocabulary they use for coding people and places as civilian or noncivilian. Civilians are not simply “found,” they are produced through specific forms of professional vision. The nineteenth-century strategist Carl von Clausewitz describes “fog” and “friction” as fundamental features of war. Military leverage of sophisticated information technology in the twenty-first century has improved some tactical operations but has not lifted the fog of war, in part, because the means for reducing uncertainty create new forms of it. Drawing on active duty experience with an American special operations task force in Western Iraq from 2007 to 2008, this article traces the targeting processes used to “find, fix, and finish” alleged insurgents. In this case they did not clarify the political reality of Anbar province but rather reinforced a parochial worldview informed by the Naval Special Warfare community. 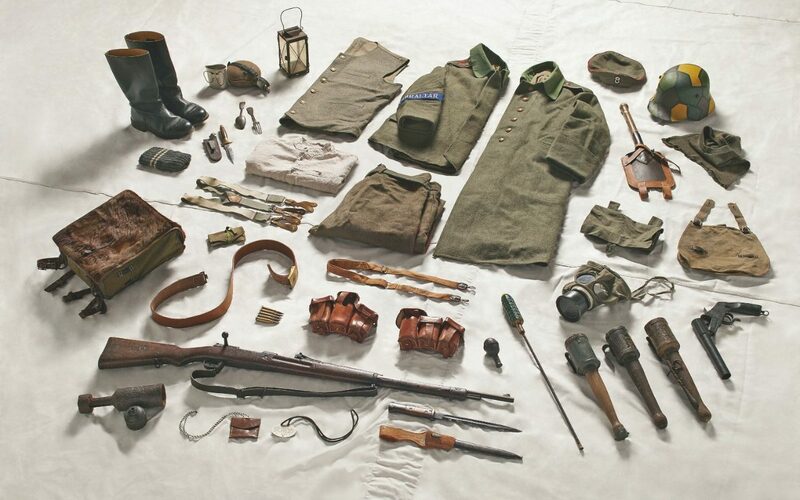 The unit focused on the performance of “direct action” raids during a period in which “indirect action” engagement with the local population was arguably more appropriate for the strategic circumstances. The concept of “data friction”, therefore, can be understood not simply as a form of resistance within a sociotechnical system but also as a form of traction that enables practitioners to construct representations of the world that amplify their own biases. This article analyzes US drone operations through a historical and ethnographic analysis of the remote split paradigm used by the US Air Force. Remote split refers to the globally distributed command and control of drone operations and entails a network of human operators and analysts in the Middle East, Europe, and Southeast Asia as well as in the continental United States. Though often viewed as a teleological progression of “unmanned” warfare, this paper argues that historically specific technopolitical logics establish the conditions of possibility for the work of war to be divisible into discreet and computationally mediated tasks that are viewed as effective in US military engagements. To do so, the article traces how new forms of authorized evidence and expertise have shaped developments in military operations and command and control priorities from the Cold War and the “electronic battlefield” of Vietnam through the Gulf War and the conflict in the Balkans to contemporary deployments of drone operations. The article concludes by suggesting that it is by paying attention to divisions of labor and human–machine configurations that we can begin to understand the everyday and often invisible structures that sustain perpetual war as a military strategy of the United States. I’ve discussed Christiane’s excellent article in detail before, but the whole issue repays careful reading. And if you’re curious about the map that heads this post, it’s based on the National Security Agency’s Strategic Mission List (dated 2007 and published in the New York Times on 2 November 2013), and mapped at Electrospaces: full details here. 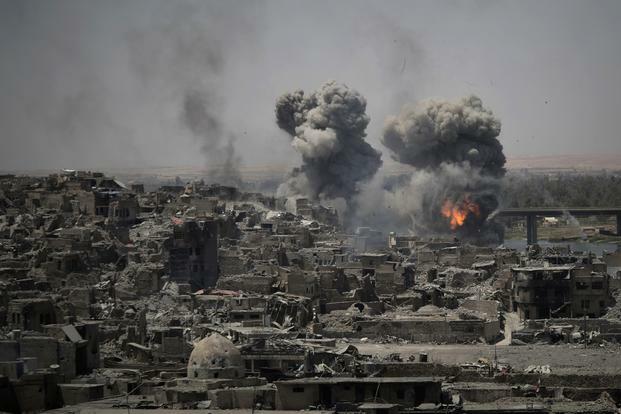 Although there is often opposition to individual wars, many people continue to believe that the arms industry is necessary in some form: to safeguard our security, provide jobs, or stimulate the economy. For these reasons, not only conservatives, but many progressives and liberals, are able to rationalize supporting it. But is the arms industry truly as essential as we’ve been led to believe? Indefensibleputs forward a devastating challenge to this conventional wisdom, debunking many myths about the industry that has somehow managed to normalize the existence of the most savage weapons of mass destruction ever known. 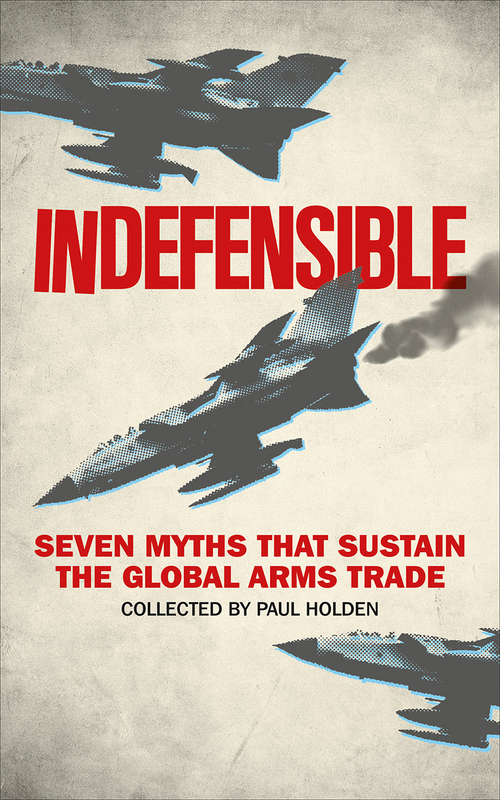 Editor Paul Holden, who himself has written extensively about arms deals, has compiled the essential handbook for those who want to counter the arguments put forth by the industry and its supporters. Deploying statistics, case studies, and irrefutable evidence to demonstrate how the arguments in favor of the arms trade are fundamentally flawed, both factually and logically, the contributors to this volume clearly show that far from protecting us, the arms trade undermines our security by fanning the flames of war, terrorism, and global instability. Bringing together a range of distinguished experts and activists, including Andrew Feinstein, author of After the Party and The Shadow World, Indefensible not only reveals the complex dangers associated with the arms trade but offers positive ways in which we can combat the arms trade’s malignant influence, reclaim our democracies, and reshape our economies in the interests of peace and human well-being. It’s available in paper and digital forms from Zed Books (see here) and the University of Chicago Press (see here) but it’s also available online where you can read the whole thing for free here. 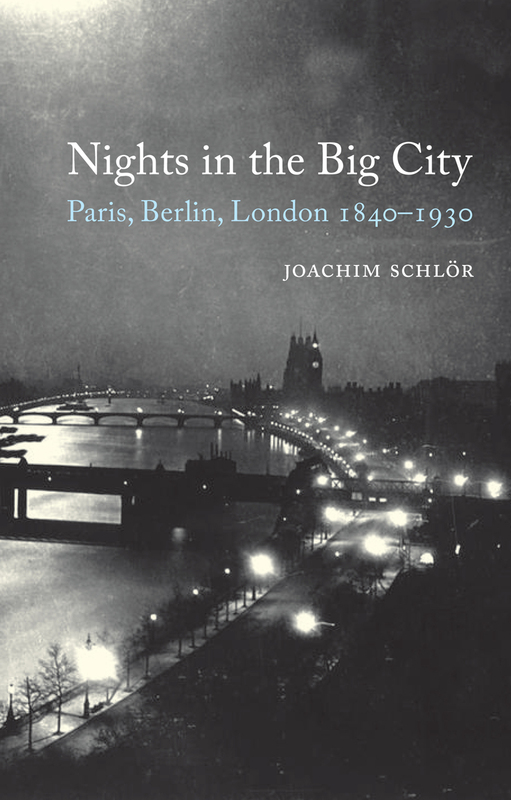 I vividly remember reading Joachim Schlör‘s Nights in the Big City when it was first published almost twenty years ago – an extraordinary reflection on the impact of illumination and the perception of night in Berlin, Paris and London between 1840 and 1930. 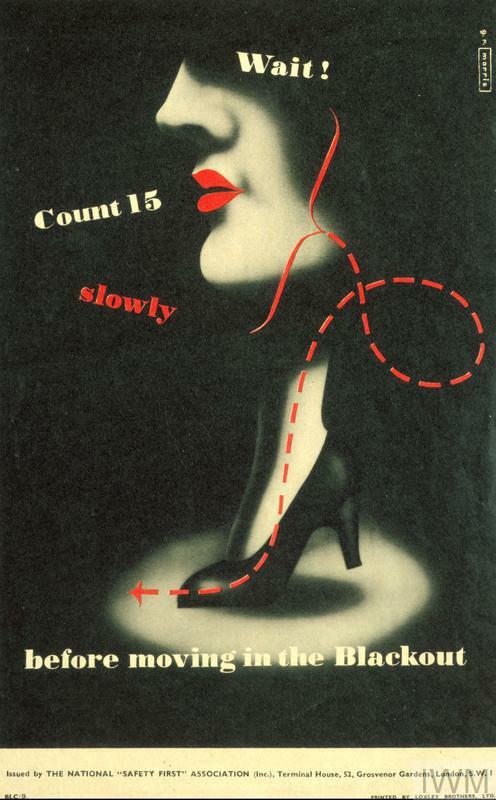 It joined Wolfgang Schivelbusch‘s elegant Disenchanted Night on my bookshelves, a text whose subtitle – ‘the industrialization of light in the nineteenth century‘ – concealed as much as it revealed the richness of Schivelbusch’s narrative. 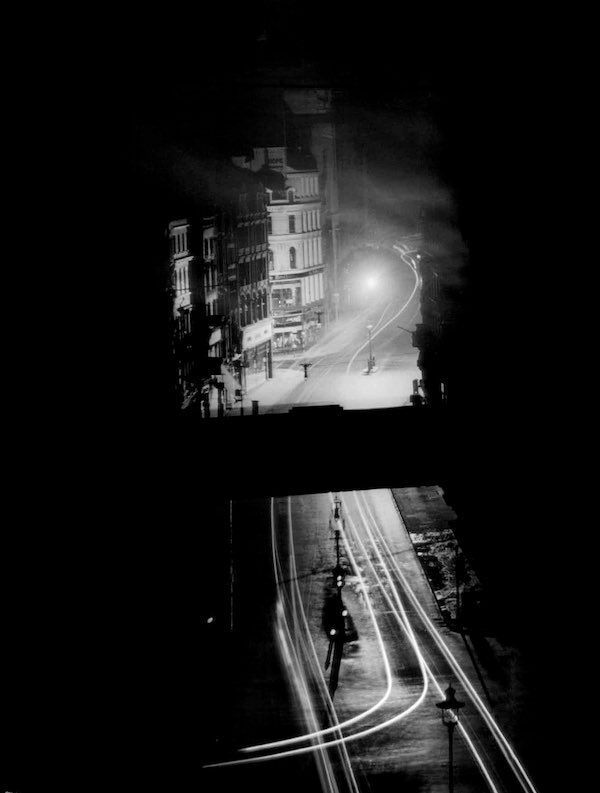 But even then I thought there was another, later story to tell: what happens when people who have become used to the (more or less) brightly lit city are precipitously plunged back into darkness? 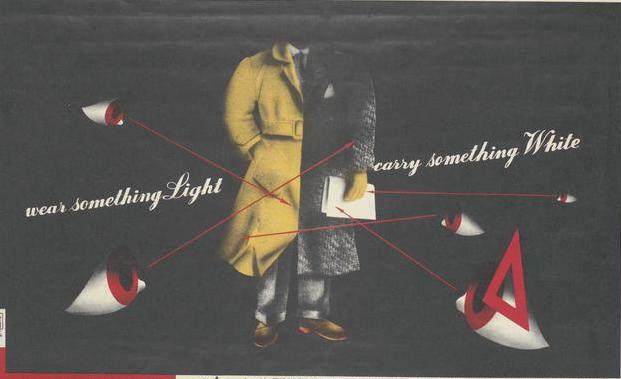 I was thinking of the blackout during the Second World War. This week I’m back at Radboud University in Nijmegen, preparing for a public presentation on aerial violence, and my thoughts have returned to my old question. 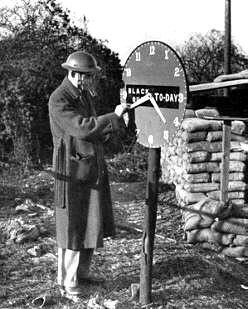 I think it’s an important one because we know so much about bombing – about crouching under the bombs, seeking cover in shelters, recovering the bodies of the dead and the injured, and then ‘carrying on’ – but we often forget that its horror is not confined to the experience of an air raid, to what Pat Barker memorably describes in Noonday as ‘a stick of bombs … tumbling down the beam of a searchlight onto a building fifty yards ahead, an extraordinary sight, like a worm’s eye view of somebody shitting.’ Others turned to the shattered language of the sublime to capture the aw(e)ful sensation of a city – their city – in flames. 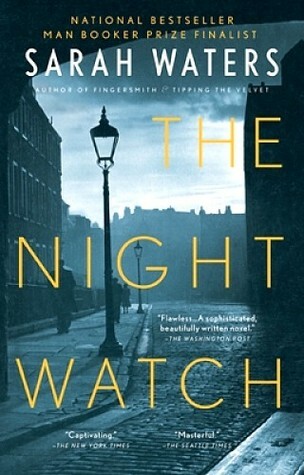 Like Noonday, The Night Watch is the product of careful research as well as a luminous literary imagination; yet historians themselves have made remarkably little of the black-out, content to leave it in the shadows and direct attention to the pyrotechnic displays of the bomber’s art. So what follows are merely notes, and even then confined to Britain, waiting a larger project. (In fairness, there is an important PhD thesis by Marc Wiggam, The Blackout in Britain and Germany during the Second World War (Exeter University, 2011), but his main concerns are policy and policing, and the discussion of cultural formations is largely confined to contemporary literary and film representations and says little about everyday life). Britain had introduced a limited blackout in 1915, when its cities were menaced by Zeppelins and Gotha bombers. 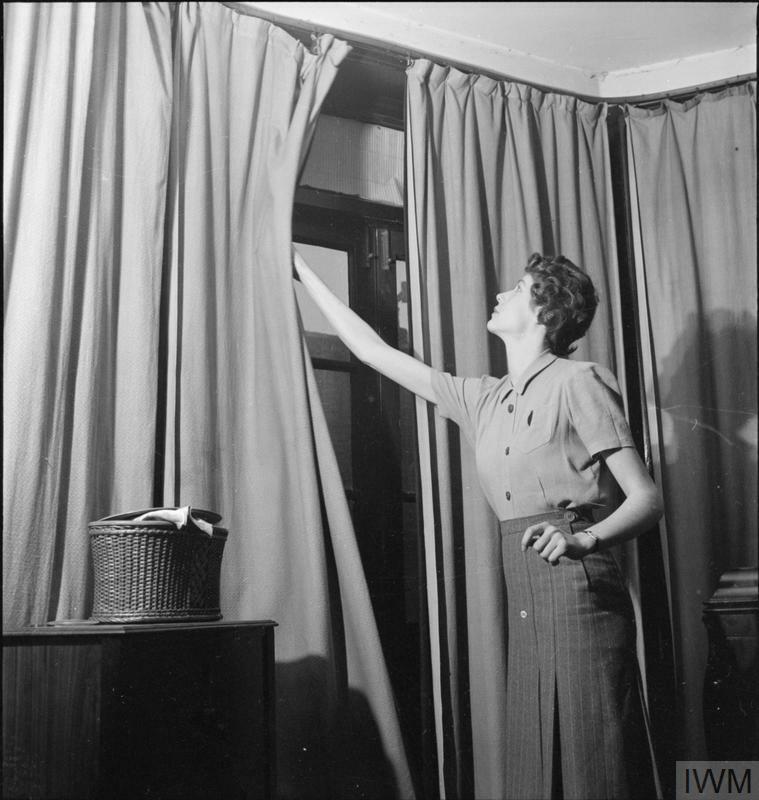 In 1937, keenly aware of Stanley Baldwin‘s bleak injunction in his speech ‘A Fear for the Future’ that ‘the bomber will always get through’, the British government was already making plans for air raid precautions. ‘London had become two cities. The one, the daytime city where we went about our business much as before, worked in our offices and discussed what plans we could make for the future… The other London was the new, symbolic city of the blackout, where one floundered about in the unaccustomed darkness of the streets, bumping into patrolling wardens or huddled strangers…’ [cited in Amy Helen Bell, London was ours: Diaries and memoirs of the London Blitz]. So as the blackout was carefully calculated and disseminated (above), I think it important to register the attempts to impose an order upon and within its envelopment of the city. 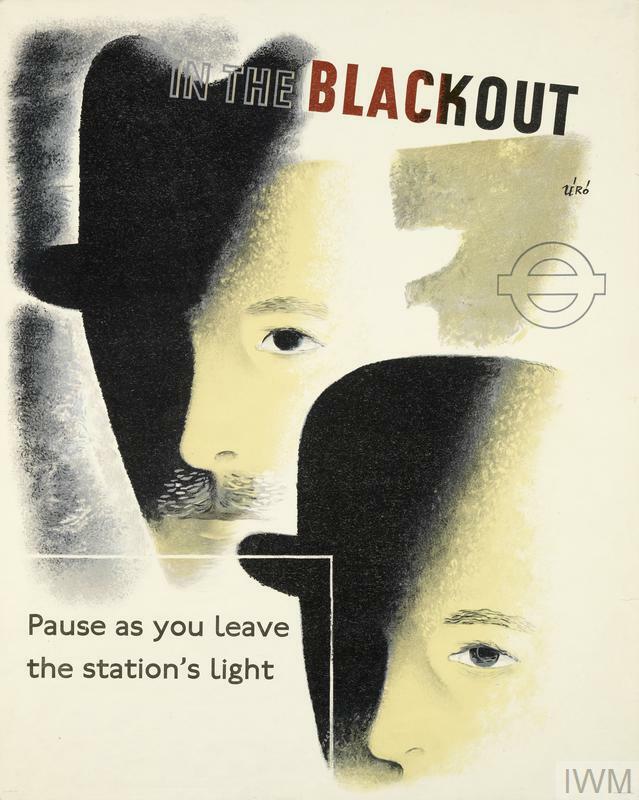 When leaving the dimmed but illuminated interior of a house, a railway or a tube station, travellers were advised to close their eyes and count to fifteen to prepare for the abrupt plunge into darkness. 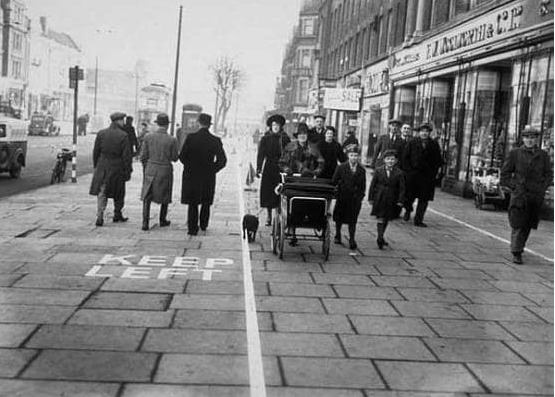 It was even more difficult for drivers, especially those rushing to provide emergency help at the scene of an air raid. Again, Sarah Waters is brilliant at conjuring the experience of her volunteer ambulance drivers during the Blitz. Often, the flames cut through the darkness to provide hideous illumination. 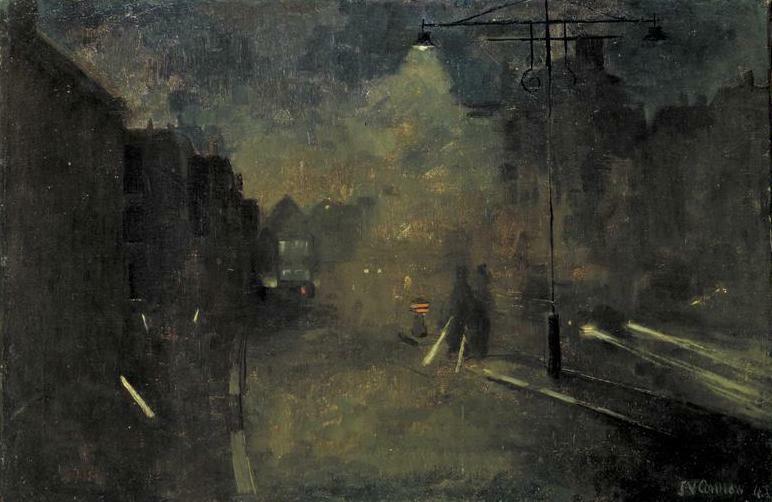 ‘You didn’t need any lights or maps to find the way,’ one City of London fireman observed, ‘you just headed for the glow in the sky’ (below). 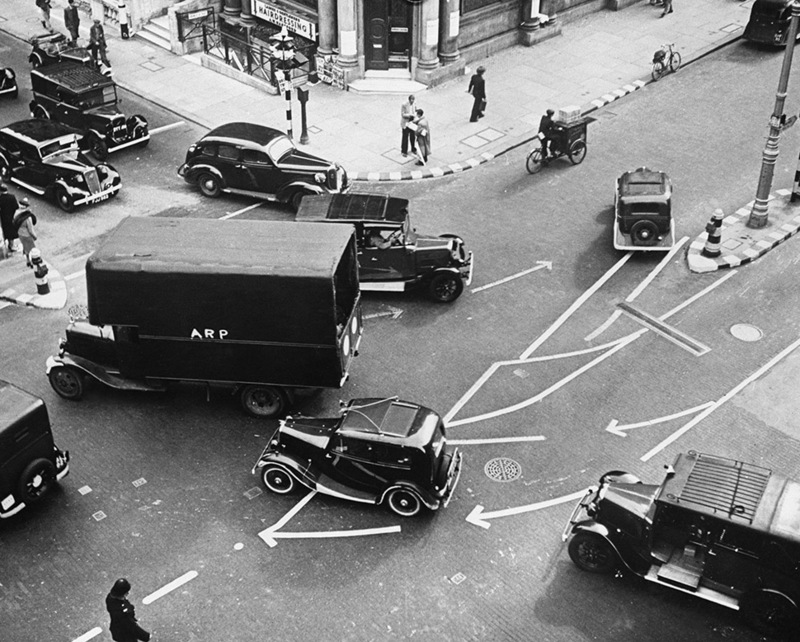 By the beginning of 1940 more people had been killed in road accidents than by enemy action. 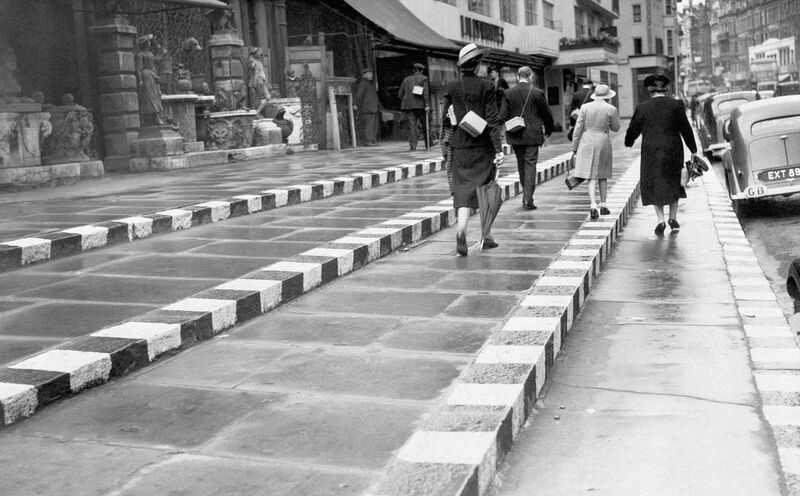 Ironically one of the first was a council employee hit by a vehicle as he painted a white line on a curb near Marble Arch – these lines, marking curbs and steps, were intended to help people navigate the darkened city. 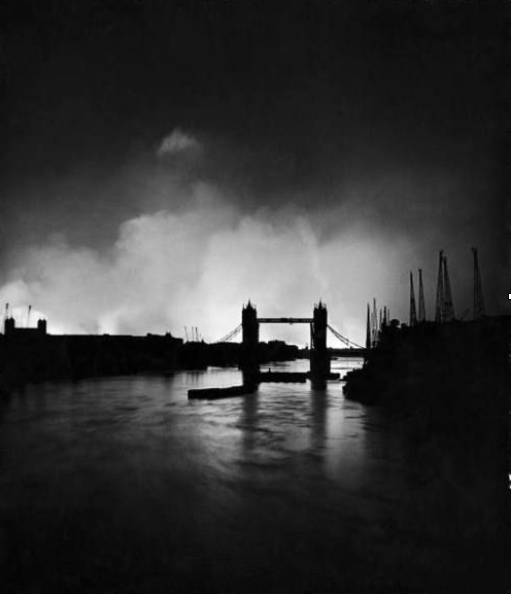 You can find more photographs of London during the blackout at mashable here and, of course, via the Collections page of the Imperial War Museums. News from Madiha Tahir of an upcoming special issue of the ever-interesting Public Culture; if you are interested in contributing, note that the deadline for abstracts/proposals is 1 August. What is policing? What are its sites and modes of the operation? In Althusser’s famous example, it is the policeman’s hailing that transforms the individual into a subject. For Rancière, the police, understood as the naturalization of the social order, is the opposite of politics. As a label, policing has been deployed for a range from practices: from policing as a liberal ideal form of consent-based maintenance of law and order to policing as the maintenance of a certain “distribution of the sensible” to policing as a practice of empire (e.g. British aerial policing or the U.S. as global policeman). 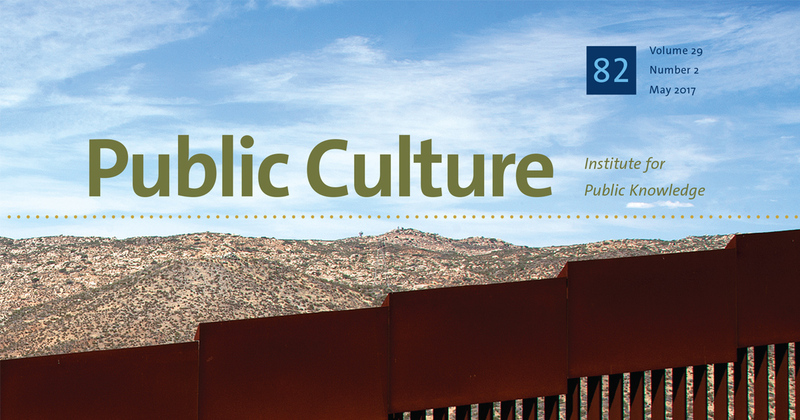 Public Culture seeks a series of essays on the police and policing as concept, practice, discourse and institution. 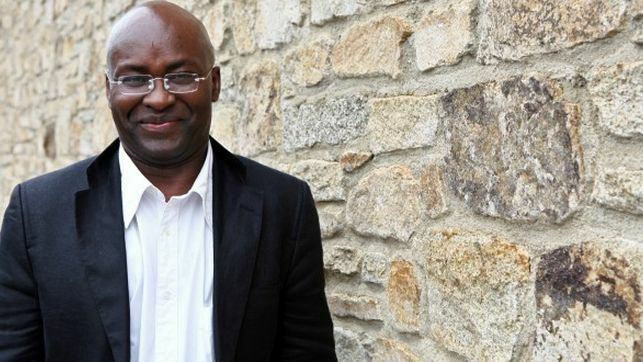 In 2003, Public Culture published what has become a seminal piece: Necropolitics by Achille Mbembe in an issue called Violence and Redemption. Authors may think about putting these two concepts in conversation (though this is certainly not a requirement): e.g. if politics is the work of death in spaces subjected to a continual state of emergency as Mbembe has argued, how does policing conceptualize or account for (or not) the work of death across multiple, variously inflected spaces from Florida to Afghanistan? We seek essays that will provide accounts of and extract lessons from a range of sites that allow us to better understand the relationship between policing and violence: this might mean accounts from municipal police departments from New York to Palestine, or of movements like Black Lives Matter or No Dakota Access Pipeline and their engagements and resistance to the notion of ‘the police’ and policing. Approaches need not be attached to place alone. We seek insights from the construction of the ideas of dis/order and their material policing: the regulation of borders and mobilities for example, or the relation of policing to consent, or the policing of language as im/proper. Finally, we also seek (re)conceptualizations of the notion of the police and policing and engagements with them as aspects of disciplinary regimes or control societies, or as the negation of politics, and so on. As this indicates, we hope for an expansive range of empirical sites as well as theoretical articulations that attempt conceptual and comparative border-crossings. Send abstracts of 200-300 words to shamuskhan@gmail.com by August 1st. Editors will review abstracts, comment, and solicit full papers for review. 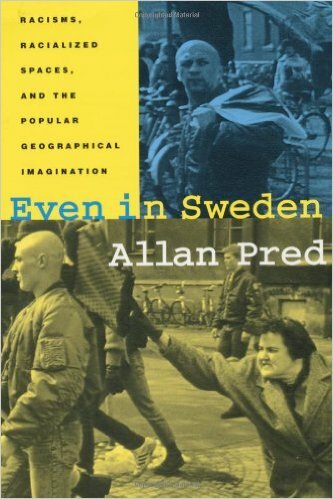 In the wake of the Trump administration’s shock at the non-existent Bowling Green Massacre, its fabricated comments on immigrants, refugees and crime in Sweden (for the record, I’ve been to Rinkeby in the company of Nordic geographers, and I also have Allan Pred‘s brilliant Even in Sweden on my shelves: and I’d also recommend Gavan Titley‘s elegant ‘Swedens of the mind‘ over at Critical Legal Thinking), and – in spectacular contrast – Trump’s sullen silence over attacks on immigrants, refugees and Muslims that did happen, The Bureau of Investigative Journalism has just published an important and incisive take-down of a map that went viral (the mot juste) in 2016. Last year, an anonymously-produced map started to make its way around German social media. It claimed to show viewers the spread of “refugee and migrant crime” throughout Germany. Unlike some of the lurid tales of migrant depravity that have circulated in Germany in recent months and turned out to be false, the interactive map seemed professionally put together. Each pin on it correlated to a police or media report of a crime (“we don’t document cases simply on the basis of hearsay”, its makers claimed). 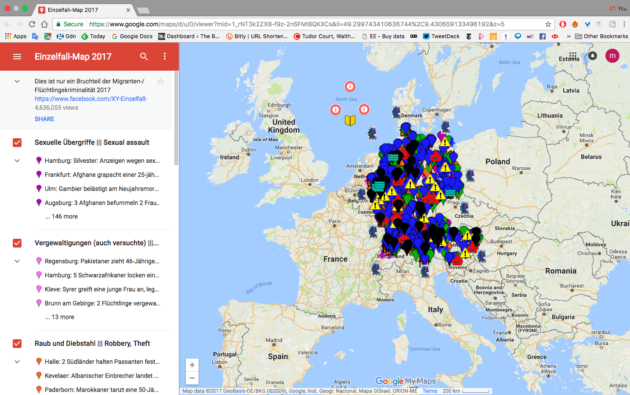 The map, called XY-Einzelfall (a sarcastic riposte to the idea each migrant crime is simply an ‘isolated case’ – Einzelfall in German) was viewed more than four million times. But analysis of the map’s methodology by the Bureau of Investigative Journalism shows that it is systematically misleading, often attributing crimes to migrants or refugees on the basis of nothing more than a witness statement that the perpetrator was “dark-skinned” or “southern”. On top of this, the project vastly overstates the figures on migrant crime through skewed use of statistics. Tracing the map’s presence on social media also shows it to be far from politically neutral. An account in XYE’s name on the Russian social media site VKontakte is rife with the kind of pro-Trump pro-Putin memes which have become the signature of the global alt-right. These are also the dominant affiliations of the Twitter accounts promoting the map. Overtly racist and xenophobic memes are also commonplace. The map’s creators like to portray their approach as scientific, mimicking the language of academics and think tanks. In January they released a “7-day analysis of published police reports”, with a breakdown of crimes by groups of different origins and a headline suggesting that 84% of crimes were committed by migrants. In fact, the 84% figure is completely misleading. The map makers have stripped out all crimes in which the perpetrators’ background is not mentioned from their calculation. The true percentage of crimes in this period committed by migrants – according to XYE’s own data – is 13%. There is a further 13% of crimes which the XYE say are ‘probably’ committed by migrants. We looked at how XYE decide that each pin on the map represents a crime which could have been committed by migrants. They comb police and media reports and pull out descriptions of perpetrators. We found that almost two-thirds of their reported offenders fell into the categories of “dark-skinned”, “southern-looking”, “foreigner” or “refugee”. We then selected a random sample of 100 reports within each of these four categories for closer analysis. We found that in nearly all cases where the perpetrator was described as “dark-skinned” or “southern”, there was no evidence in the sources positively identifying them as a migrant or refugee. This was also true of the overwhelming majority of cases where the offender was described as a “foreigner”. I’m en route to Vancouver, so forgive the brevity of this notice of such an important issue.